The Maitland center is around 2 miles north of Winter Park Amtrak and 2 miles east of RDV Sportsplex. Oakwood at Dwell : 8700 Maitland Summit Blvd. Days Inn Altamonte Springs : 150 South Westmonte Dr.
Towneplace Suites Orlando Altamonte Springs / Maitland : 151 Douglas Ave.
Ramada by Wyndham Altamonte Springs : 150 Douglas Ave.
Residence Inn by Marriott : 270 Douglas Ave.
Maitland is a little over half an hour from Universal Studios Orlando, SeaWorld Orlando, and Walt Disney World. If you want to include some of these major attractions in your visit, you can hop over easily for a day in the parks. Downtown Orlando is just 20 minutes away. Home to highlights like the Amway Center, Bob Carr Performing Arts Center, and Dr. Phillips Center for the Performing Arts, Orlando offers attractions that cater to both business and pleasure. The Orange County Convention Center is a massive facility that can handle events of all sizes. The North/South building's exhibition hall alone covers 22 acres. The facility offers over two million square feet of exhibition space across both buildings. There are 74 meeting rooms, 232 breakout rooms, eight food courts, and 174 truck bays. Whether you're staying in Maitland for access to Orlando's bustling entertainment, or you're after its outstanding business opportunities, you'll find that this area has the perfect hotel for your needs. Maitland, Florida offers warm weather year-round, so you don't have to worry about a cold off-season here. During the summer months, you'll find highs in the 90s and lows in the 70s. These are the wettest months of the year, with between six and eight inches of monthly precipitation on average. Hurricane season lasts from June through November, and daily showers are common during these months. The heat and humidity don't dissuade the summer crowds, however. Families off school for the summer flock to the area, and hotel prices skyrocket as a result. Autumn offers a slightly cooler alternative. Average highs fall into the 80s, and may dip into the 70s by November. September and early October are the best option in fall. 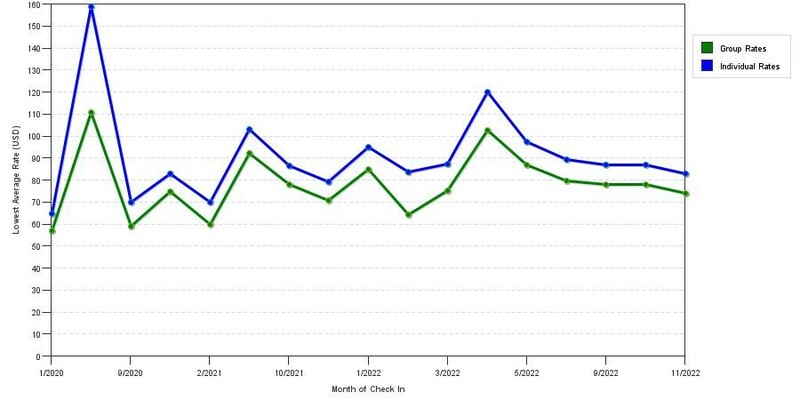 If you get too close to holidays like Halloween and Thanksgiving, the crowds and hotel premiums return. Winter in Maitland is relatively warm with highs in the 70s and lows in the upper 40s and low 50s. 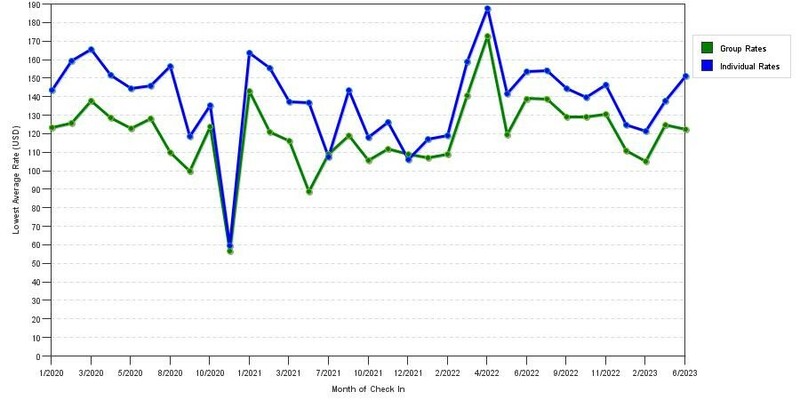 December brings holiday crowds, but January is a quiet option with low hotel rates and only moderate tourist traffic. Early spring is a prime choice for visiting Maitland and the surrounding area. Temperatures are in the 70s during the day and 50s at night. 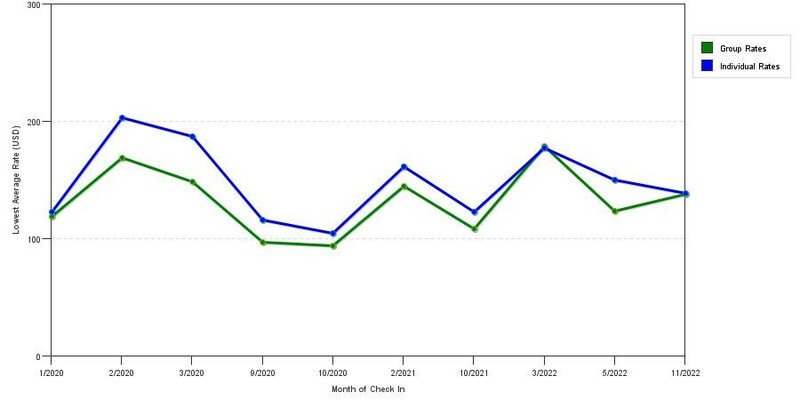 Crowds are low leading up spring break, and hotel prices stay equally manageable. Below we've posted 3 graphs illustrating avg. rate patterns by star rating class in Maitland, FL. 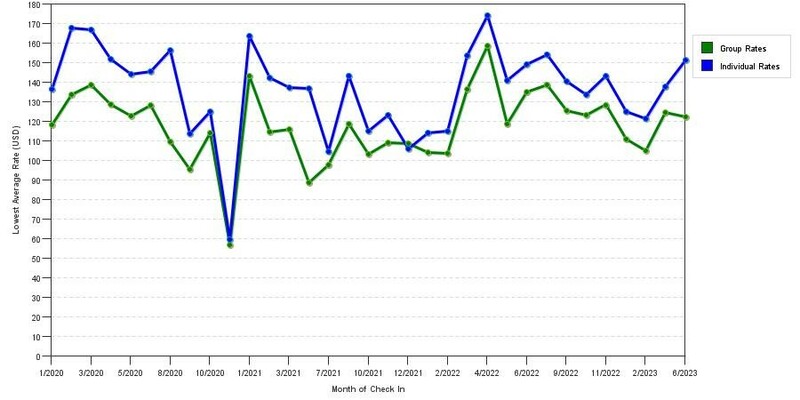 Browse these line graphs to evaluate the least expensive time to make a reservation in Maitland for upcoming travels. If you're looking for luxury accommodations near Maitland, your best option is to look to the south in Winter Park. Just minutes from Maitland's destinations, these hotels offer the luxury amenities and opulent details that you're after. The Alfond Inn offers a warm welcome from the moment you step into the airy, sunlit lobby, complete with tall windows and a stunning skylight. A quiet library connects the chic lobby to the on-site bar, offering the ideal spot for a laid-back afternoon. The lush tropical courtyard offers all the ambiance of Florida, while the elevated pool begs you to take a refreshing dip. Hamilton's Kitchen uses locally sourced ingredients to provide a distinctive menu that's bursting with flavor. Try dishes like the hearty ham and cheddar croissant for breakfast, fish tacos with the local catch of the day for lunch, and gourmet chicken confit for dinner. You can work off any extra indulgences in the fully equipped fitness center. The Park Plaza Hotel Winter Park is another luxury pick in the area. Constructed in 1922, this boutique hotel offers timeless charm. Rooms feature distinctive accents like exposed brick walls, Bermuda shutters, wood floors, and art from local Paul Crumrine. A free continental breakfast is delivered to your room each morning, featuring jumbo muffins, orange juice, and hot coffee. Lunch and dinner are available on-site at the Park Plaza Gardens Restaurant. The Maitland area offers an affordable alternative to hotels south of Orlando, closer to the theme parks. Many of the most affordable options in this area are also quite luxurious, like the Sheraton Orlando North Hotel. This destination offers convenient on-site dining at An Tobar Irish Pub. The hearty menu here includes options like Reuben sandwiches, fish and chips, bangers 'n' mash, and shepherd's pie. Additional hotel features include a sparkling outdoor pool, hot tub, and fitness center. A complimentary shuttle provides transportation anywhere within a three-mile radius. There are two Extended Stay America – Orlando – Maitland locations to choose from for an affordable long-term stay in the city. These hotels offer suites with fully equipped kitchens, including refrigerators, stovetops, microwaves, utensils, dishes, and cutlery. A complimentary grab-and-go breakfast is available for busy travelers on the run. The 1776 Pembrook Drive location also features a swimming pool and BBQ grill for added fun. The Sheraton Orlando North Hotel offers special rates for AAA members, AARP members, government employees, military personnel, and Florida residents. Seasonal specials offer additional savings as well as special perks like a complimentary breakfast for two. Starpoints members can use or earn points with their stays at this hotel. Extended Stay America hotels offer the Extended Perks program for frequent travelers who want to earn points on each stay. You can also score a discounted rate at these hotels if you're a AAA member, senior, government employee, or member of the military. The Courtyard Orlando Altamonte Springs/Maitland is part of the Marriott Rewards program. Earn and redeem points for discounted stays at this and other Marriott hotels around the country. This hotel also offers discounts for AAA and Canadian Automobile Association (CAA) members, seniors, government and military personnel, and corporate travelers. If you're a member of the Hilton HHonors program, book your stay at the Homewood Suites by Hilton Orlando-Maitland. where you can earn more points or use the points you've accumulated at other locations. Hilton hotels offer discounted rates to CAA and AAA members, seniors, and military families. Value hotels offer the perfect combination of affordability and convenience. These destinations provide ample amenities for a mid-range price, ensuring that each dollar you spend goes as far as possible. The Courtyard Orlando Altamonte Springs/Maitland offers conveniences like complimentary Wi-Fi, a fitness center, an outdoor pool, and a relaxing whirlpool. Each guest room features a mini-fridge and microwave so you can easily store chilled beverages or heat small snacks in your room. Your lineup of premium television channels includes HBO, CNN, and ESPN. A hot breakfast is available downstairs for a moderate fee. The Bistro serves Starbucks coffee and light lunches and dinners with options like flatbread sandwiches, seasonal salads, and sweet treats. Enjoy all the comforts of home at the Homewood Suites by Hilton Orlando-Maitland. Wake up to a hot buffet breakfast, free of charge, so your morning can always start right. Keep your bikini body in shape with the on-site fitness center, or head out to recline by the outdoor pool. If you're in town for work, you can handle all your important tasks with the 24-hour business center. Looking for quiet entertainment in your room? Check out the video and book library. Monday through Thursday, you can end your day with the hotel's evening social. The all-suite accommodations here feature separate living and sleeping areas. Each suite has a fully equipped kitchen, including a full-size refrigerator, microwave, dishwasher, and two-burner stove. An on-site convenience store will help you stock up on the basics. You don't need a car to enjoy the highlights of Central Florida. Maitland has a convenient SunRail Station that also serves as a Lynx bus stop. SunRail offers both southbound and northbound departures every 30 minutes. With 12 stops throughout Seminole, Orange, and Volusia counties, SunRail can get you to nearly any destination. Fares range from $2 to $4 one-way, or $3.75 to $7.50 round-trip depending on the number of counties you travel through. SunRail offers several connections to Lynx stops so you can coordinate the two to get you within steps of your final destination. The Lynx bus system operates 77 daily routes throughout Orange, Seminole, and Osceola counties, covering 2,500 square miles. You can enjoy unlimited LYNX rides for just $4.50 a day, or $16 per week. If your destinations are downtown, you can hop on the free LYMMO Orlando bus system. LYMMO operates four lines that run seven days a week. You can navigate International Drive easily with the I-Ride Trolley. Fares are $2 per ride or $5 per day. You'll enjoy additional savings if you purchase a multi-day pass. Whether you're planning to enjoy the top-notch features of the Orange County Convention Center for a business retreat, or you're staying in Maitland to enjoy the world-class attractions in Central Florida, you can book a Maitland hotel that's perfect for your visit.